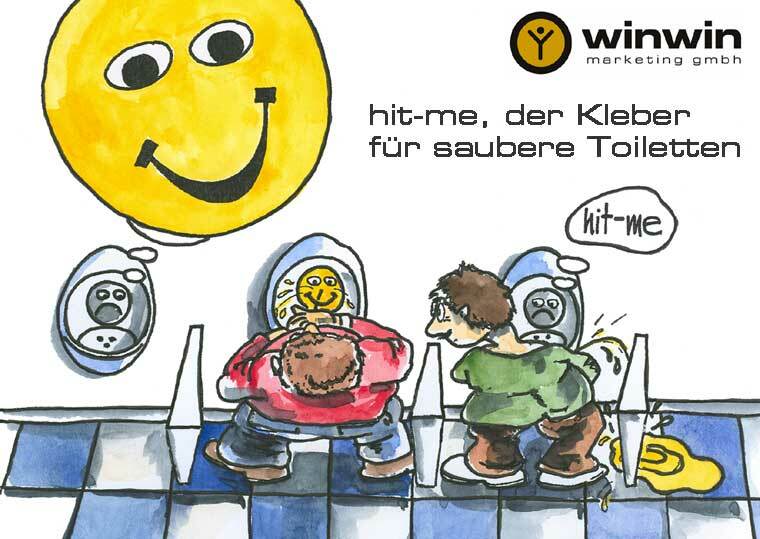 hit-me is the idea of the Swiss marketing company winwin. It’s a small sticker about 3cm in diameter showing a sad Smiley; yellow on black background. When the sticker comes in contact with urin the sad Smiley changes its mood. The happy Smiley is black on yellow background. So, in order to make the Smiley happy, man has piss right against the Smiley’s face. Sick. Men have a tendency to miss the urinal and hit wall/floor instead, making a real mess. Hence, one needs a measure to improve a man’s “hit rate” (direct the urin into the urinal). Men like to piss against some other creature’s face. Afterall, that creature seems to like that; it smiles, right? Yuck, do male brains really work that way? Well, mine doesn’t. Here’s a little comic that explains how hit-me works. Comments Off on Men are all pigs!? Apple iPhone lovers: count me in! No, I won’t describe the revolutionary features of the new iPhone announced this week by Apple at Macworld Expo. Check out Apple’s website and – MUCH better – watch Steve Job’s keynote for that. The fact that Apple only wants to ship the iPhone in June in the US and in the fourth quarter of 2007 in Europe, however, leaves plenty of “room for improvement”. Many of my own thoughts about the coolest mobile device ever to see the light of this world appear in an New York Times online article. Of course, there are zillions of blogs rating about all the issues iPhone supposedly has. Paul Kedrosky runs just one of them. The device itself is a KILLER, yes, but I’m eargerly awaiting some information regarding the carriers in Europe. While Apple opts for Cingular as the exclusive carrier in the US I think that strategy won’t work here in Europe. The market is simply different. The problem here is that wonderful features such as Visual Voicemail (“An industry first, Visual Voicemail allows you to go directly to any of your messages without listening to the prior messages.”) require a carrier to make modifications to his infrastructure and his services. How many carriers are willing to do that? At what costs? What does Apple have to offer them in return? Of course, one major shortcoming I expect to see corrected is the lack of 3G network support. I think 3G support is a MUST for any multimedia mobile device. I’m in no doubt that the iPhone released in June to the US public will be quite a bit different from the one Steve Jobs presented this week.